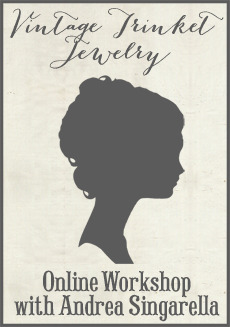 Occasionally, a sweet customer or blog reader will send an email asking for my address, saying they have a little something they would like to send my way. Of course, I am happy to oblige....who doesn't love to receive fun, unexpected gifts in the mail?! These girls were so thoughtful and kind to think of me, and I wanted to share some of the wonderful surprises that have landed on my doorstep recently. This incredible necklace is a gift from a sweet new friend, Muguette. 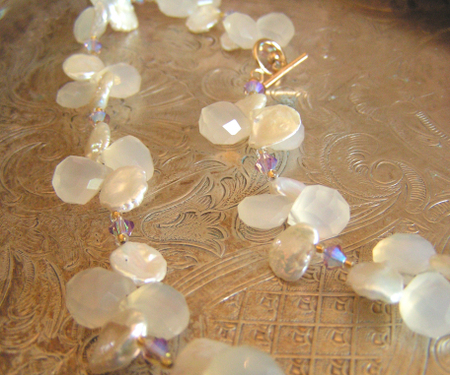 She creates gorgeous beaded gemstone jewelry and sells her pieces (and more) in her etsy shop, aptly named Muguette Renee. 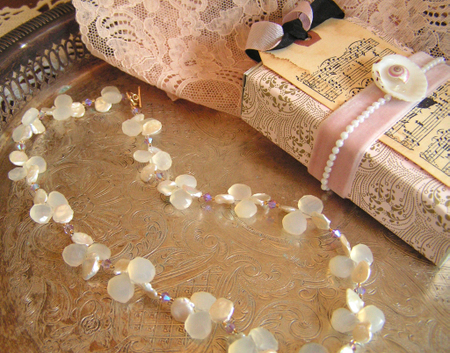 The beads on this necklace are Chalcedony and Petal Pearls. So delicate and stunning. I just love it and have worn it several times already. She also decorated a large matchbox and stuffed it full of trinkets, charms and beads found on her travels around the world. A girl after my own heart! Thank you so much, Muguette! Sweet Tiffany from Shabby Scraps Boutique, sent this jumbo-size wool strawberry pin cushion in the prettiest pink and green sherbet colors I could ever dream up. How cute is this? I was practically squealing when I opened the box! I photographed it next to some berries I took off of a purse so you could see the difference in scale. It's huge. 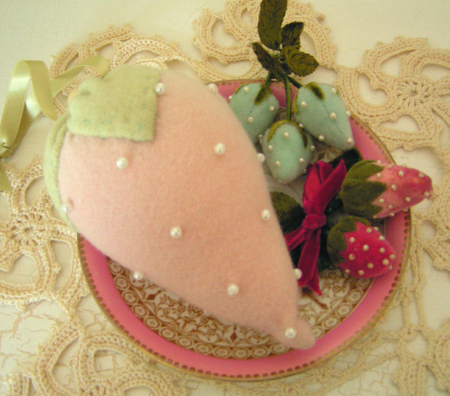 Pink, pale green, strawberry, seed pearls, what's not to love? It's hanging on my inspiration board in my studio/office, and it makes me smile every time I see it. Thank you Tiffany! One of my dear customers, Kathryn, emailed me and said," I have something I need to send you. It was meant for you". 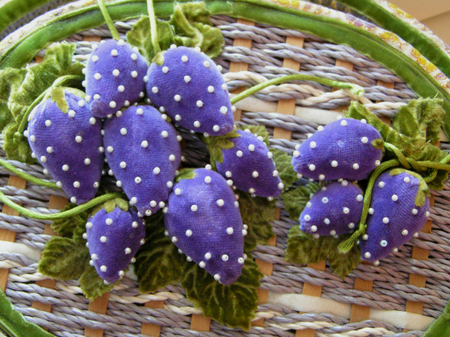 She found this purple velvet strawberry-covered sewing basket at a yard sale! Can you imagine? The top is covered in berries and there are some more on the front. Love that green velvet ribbon trim too. 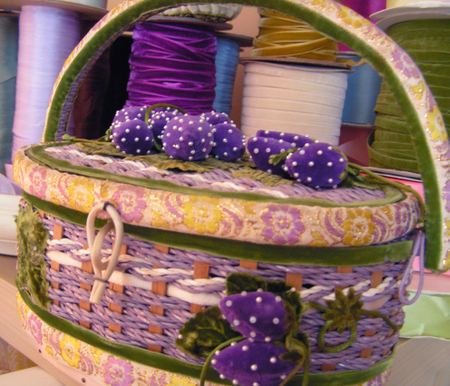 She filled it with matching purple and green vintage trims, seam binding, rick rack, an olive green cloth tape measure (love!) and a hot pink leather journal. Here's the front. It's meant to be a sewing basket, but could definitely be carried as a purse. Thank you Kathryn! You know I love this! A big thank you hug to each of you for thinking of me and sending such thoughtful mailbox surprises. I'm so grateful and will truly cherish these pretty gifts!